The Syrian uprising has divided the international Left between those who support Assad and those who support the Syrian opposition, while muting the voices of Syrians whose realities force them to reject simple binaries. 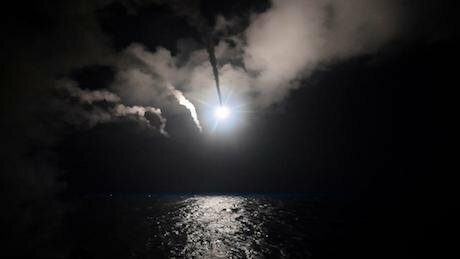 USS Porter launches Tomahawk cruise missiles at Shayrat airbase in the Mediterranean Sea. Picture by MCS 3rd Class Ford Williams/Zuma Press/PA Images. All rights reserved. When I sent off my piece three weeks ago for Latterly’s Spring issue on the narrative war around Syria, Trump’s position on the conflict seemed like an embrace of that war’s weary status quo. Bashar Al-Assad was set to stay, a partner in the tacit alliance against ISIS and terrorism struck by the Obama administration. But within forty-eight hours of the chemical weapons attack on the northwestern town of Khan Sheikhoun on April 4, 2017, Trump abruptly reversed U.S. policy, launching the first military strike against the Assad regime since the war’s start. He did so without seeking congressional approval for the use of force or entertaining diplomatic options, sidestepping procedural and legal constraints, in order to flex U.S. military muscle. The air strike was welcomed by the activist and political quarters of the Syrian opposition. Understandably, the symbolism of such a clear rebuke offered the first dose of hope for Syrians who have lost their country to Assad. It also revived long-simmering debates, particularly within the Left, over U.S. intervention on the side of the Syrian opposition. During the course of the Syrian uprising, the international Left has found itself splintering. Divisions have appeared between those who support Assad, whether as an ‘anti-imperialist’ or secular defender against Islamism (which is as ridiculous a notion as that of Trump as human-rights crusader), and those who support the Syrian opposition, which has increasingly fractured, over time, as a result of Assad’s battering and infiltration by Islamic fighters and brigades. While some leftists advocated for U.S. and Western intervention as soon as Assad’s brutal suppression of the uprising started in 2011, other leftists have resisted the call. After Syrian and international groups started to push for a no-fly zone at the end of October 2011, which depended upon U.S. support and leadership, this divide acquired a vitriolic, slanderous character. Assadists, who whitewashed the regime’s crimes, ignored Russia’s presence, and hyped the menace of jihadist groups, were labeled Nazis and fascists, while they charged that progressives inviting intervention and acting in the name of the opposition were regime-change agents of the United States. The United States’s history of supporting dictators, meddling abroad, and exerting its influence through the rhetoric of human rights and democracy has largely been responsible for condemning Syria to ideological purgatory. The Left has long stood as a critical bulwark to U.S. power, consistently exposing American hegemony. As more covert interventions gave way to aggression in Iraq in the early 2000s, the left’s mission of exposing America’s unseemly underbelly grew. But, instead of bringing greater peace and stability to the region, the international Left’s preoccupation with anti-imperialism has gradually turned the narrative about the war from one focused on Assad’s crimes to a navel-gazing debate on U.S. power. Despite the heated debates within the left, a U.S. war against the Assad regime has remained firmly off the table since the beginning of the uprising in 2011. Despite drawing a “red line,” President Barack Obama decided against military intervention in response to Assad’s chemical weapons attack on Ghouta in 2013 after failing to gain congressional approval. He resisted again during the regime’s bombardment, with Russian support, of opposition-held eastern Aleppo beginning in September 2016, escalating its longstanding barrel bomb campaign, despite pleas and media campaigns for a no-fly zone organized by grassroots Syrian groups and pro-opposition allies. Yet, despite this hesitance to actively defend the Syrian people, the Obama administration remained militarily engaged in prosecuting the War on Terror in Syria. In August 2014, the U.S. began bombing ISIS in Iraq. Only a month later, the strike quickly developed into an “open-ended campaign,” widening the battlefield to Syria. With the specter of terrorism once again lurking, Obama stepped into the shoes of the commander-in-chief to marshal U.S. forces in Syria, without congressional approval. Obama would continue to muse on the hypothetical quandary of acting for non-American lives until the end of his presidency. Meanwhile his administration’s bombing drew the United States into endless war and legitimized the very line Assad has spouted since the beginning of the uprising about combatting foreign extremists and terrorists. Many leftists, who argue against attacking Assad, conveniently ignore this on-going American involvement in the Syrian conflict. Instead, they obsessively focus on the menace of “jihadists,” while turning a blind eye toward the regime’s decades-long oppression of the Syrian people. While, of course, militant Islamic groups pose a grave threat, especially in warping territorial dynamics, they are not the central cause of the conflict, which is rooted in the crimes of the Assad regime. Sovereignty is a fundamental ordering principle, one which Russia and Iran have already violated to provide life-support to Assad. If airstrikes could take out Assad’s air force, prevent barrel bomb and chemical weapons attacks, and force Assad to negotiate, then Syrians have every right to demand this unpalatable effort. But, for the United States, the prosecution of the War on Terror, and avoidance of any American casualties, remain more important than saving the lives of hundreds of thousands of Syrians. Indeed, since Trump took office, U.S.-led coalition airstrikes in Syria and Iraq have yielded record numbers of civilian deaths, surpassing even the civilian death toll from Russian airstrikes. Consistent with U.S. policy, these airstrikes have been driven by the War on Terror agenda, rather than humanitarian feeling. Unsurprisingly, no U.S. soldiers have been killed in these strikes, so far. Trump’s decision to attack the Assad regime may be unique in its target, but it is, in fact, even more self-interested than these other American attacks. Rather than kicking off a U.S. war against the Assad regime, the airstrike was a short-term strategy to deflect attention from the Democrats’ inquiry into Trump’s ties with Russia and distract from his failed domestic agenda, including the humiliating defeat of the Republicans’ half-hearted healthcare bill. In some respects, the strategy seems to have worked. Trump’s attack received an overwhelmingly positive U.S. media response. Despite issues of procedure and law, many journalists argued, Trump was right to deliver a punitive blow against Assad. Nevermind, that this is the same president who tried not once but twice to ban refugees fleeing the same dictator. Worse still, many seemed almost giddy, watching America’s military back in action, as summed up by NBC newscaster, Brian Williams’, spellbound reaction to the “beautiful” missile strike. To understand celebrations of the American strike against Assad as anything but desperation is to willfully misunderstand the situation facing the Syrian people. Syrians are well aware that their war stands in the long shadow of Iraq and Libya, but they are also caught within a violent and endless conflict, for which the Assad regime has an outsized responsibility. That some Syrians have welcomed the bombing campaign is a reflection of this desperate situation. For the Left to once again stand up to power, especially the blanket ideology of terrorism, it must be willing to embrace this complexity. This article was originally published on Muftah and has been republished here with permision.